Angels Landing is one of the defacto classic hikes in Zion and one of the most stunning viewpoints you will ever experience, but it's not recommended for anybody with a fear of heights. Starting at the Grotto Trailhead, the hike to Angels Landing follows the longer West Rim Trail backpacking route up and out of the west side of the main canyon. Angels Landing is unique fin-like mountain formation that juts out to the center of the main canyon. The trail follows the narrow spine to the final viewpoint roughly 1500 feet above the canyon floor. This hike will take between 3-6 hours; your legs will burn, your knees may shake, and the view will take your breath away! 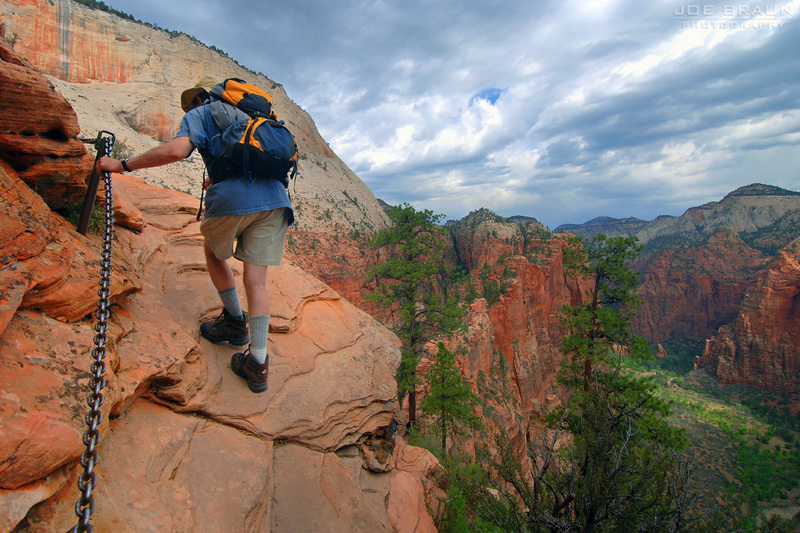 Angels Landing is an exposed hike along a narrow and precipitous rock formation. It is not recommended for small children or those with a fear of heights. Be polite, share the trail, and allow others to pass at safe spots. This is one of the most popular hikes in the park and can get very crowded to the point of being dangerous, especially by mid-afternoon during tourist season, weekends, and holidays. Consider doing some other hike if you want to avoid getting stuck in gridlock. 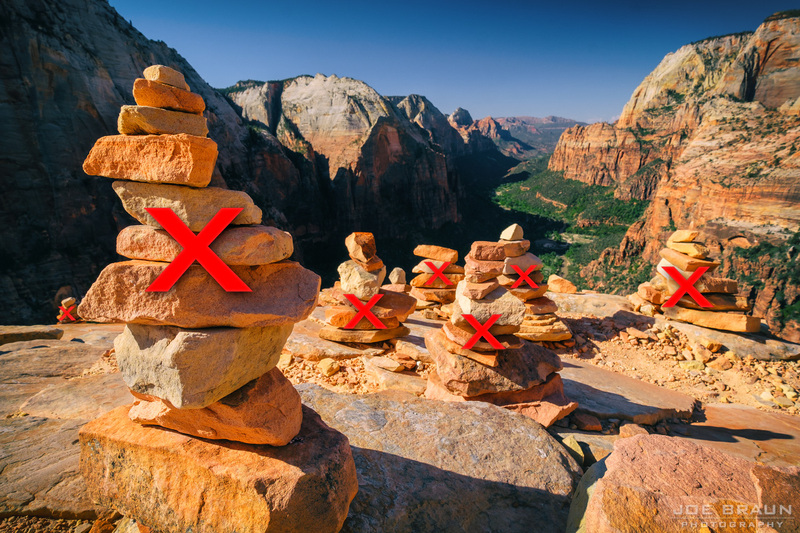 Do not carve your name into the rock formations or stack rocks (decorative cairns) for fun. This activity is illegal and it ruins the scenery for other people. Rating: Fairly strenuous and exposed day hike, not recommended for small children or those with a fear of heights. Elevation Change: 1500 feet with steep elevation gain along the trail. Seasons: Year-round. Spring and fall are most pleasant; summer can be very hot. The trail is accessible in winter, but conditions could be risky. The hike to Angels Landing starts at the Grotto Trailhead, the 6th stop for the Zion Canyon Shuttle in Zion's main canyon. 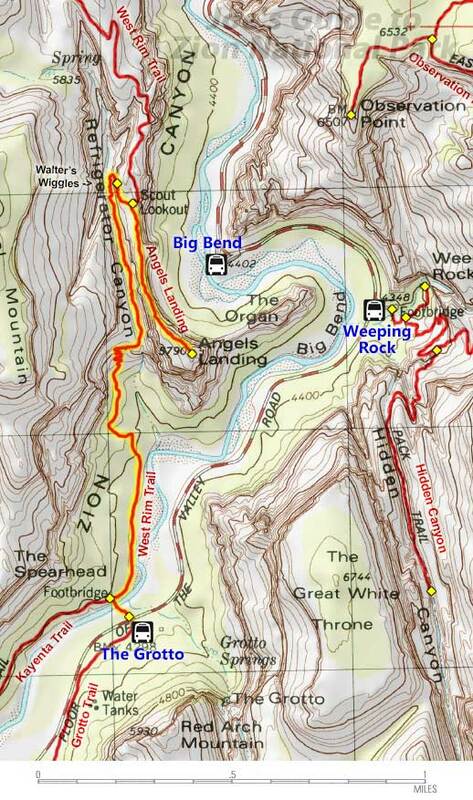 Cross the hiker's bridge over the Virgin River and follow the paved trail north and up the west side of the canyon. We are officially on the West Rim Trail right now and it's quite a strenuous and steep uphill slog to get up into Refrigerator Canyon -- a wonderful deep hanging side canyon where temperatures always remain cool. The steep incline lets up for a little bit until we get to an amazing bit of 1930's CCC engineering: Walter's Wiggles -- a set of many compact switchbacks that takes the trail all the way up to the top of the ridge above Refrigerator Canyon. A few more minutes and we arrive at Scout Lookout -- a nice little viewpoint where we can get a good look at Angels Landing and the main canyon below. This is where we leave the West Rim Trail to do the final hike to the Angels Landing viewpoint. The final part of this hike is nothing but exhilarating -- you will be walking on the narrow spine of the mountain and climbing almost 500 more feet in elevation. There are many exposed sections where you can look down on both sides to the canyon below. Plenty of chains, guard-rails, and carved steps are provided to help ease the mind. There are also several areas suitable for resting if you want to pull over and catch your breath and let other people go by. If you have no mountain-climbing or exposed hiking experience, this hike can be quite intimidating. If you are overcome by panic at the first section of chains, do not continue any further. It doesn't get any better! After a fair amount of hiking and scrambling, you will make it up to the final viewpoint and all of the effort will be worth it; the view is simply stunning! 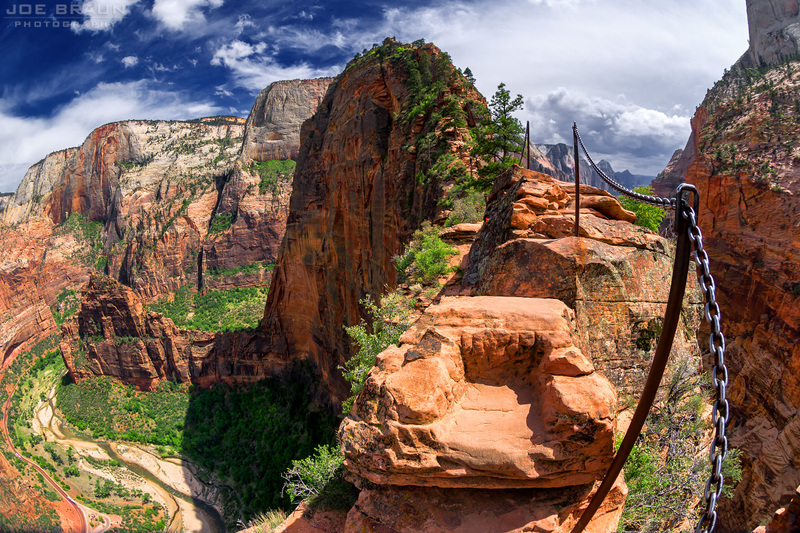 Even though Angels Landing is significantly lower in elevation than the rims, you get an amazing 360-degree view that rivals any other viewpoint you will experience. If you have any snacks, this is the perfect place to relax and partake. But don't let the aggressively friendly chipmunks steal your sandwich! Once you have had your fill, return the way you came. The hike back down the spine may actually seem less scary; it's definitely less strenuous. Once back at Scout Lookout, if you still have more energy to burn, consider hiking up the West Rim Trail a bit more; the views are well worth the effort. When done, hike back down to the Grotto and celebrate! No description of Angels Landing would be complete without a stern warning about how strenuous and exposed this hike is. If you are out of shape and don't feel very balanced on your feet, or you have young children who like to run around out of control, this hike is NOT for you. Over the past few decades, a handful of people have fallen to their deaths on this hike. I would only consider taking an older child on this hike if they had plenty of hiking/scrambling experience under their belts and they are disciplined to not run around or leave your side. Take this hike seriously and do not become a casualty. Keep a cool head, take it slowly and carefully and be courteous to other hikers. 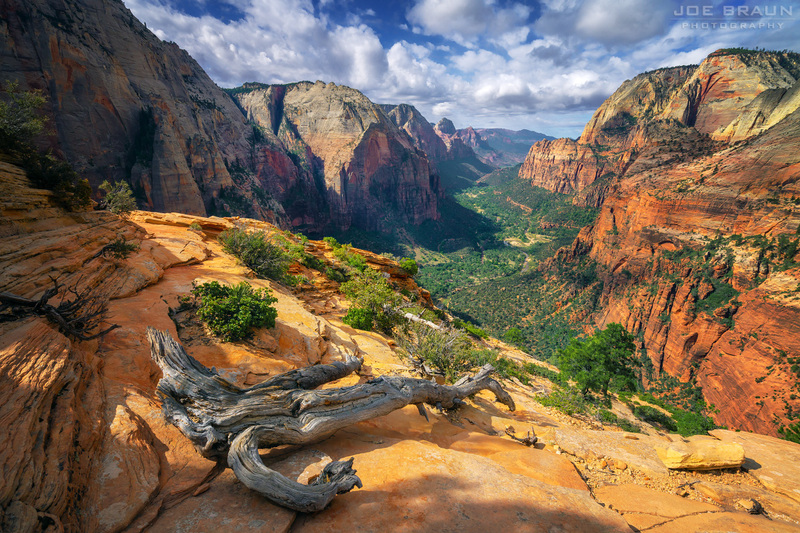 Angels Landing is one of the most popular hikes in Zion National Park and as such, the trail and viewpoint can see hoards of people each day, especially on weekends in the summer months. When the trail is crowded to the point of reaching gridlock, the situation can even get dangerous. Please be courteous and patient and let other hikers pass at safe spots along the trail. Unfortunately, due to its epic popularity, it is probable that the National Park Service may implement a permit system for this hike similar to the Half Dome permit system in Yosemite--the crowding has almost reached a point of being dangerous. And with crowds comes the need to discuss "leave no trace" principles since bad behavior encourages copycats. Please pack out all of your trash and do not leave anything behind on the trail. Please do not carve your name or anything else into the sandstone formations. Also please do not build decorative cairns at the viewpoint. While this may seem like harmless entertainment, it ruins the nature experience for others and the National Park Service considers it to be (a mild form of) vandalism. The Angels Landing trail is officially open all year long, but spring and fall have the most pleasant temperatures for this hike. Summer is the hottest and most popular season for the park, so be prepared to share the trail and sweat in the heat; an early morning start is preferable. 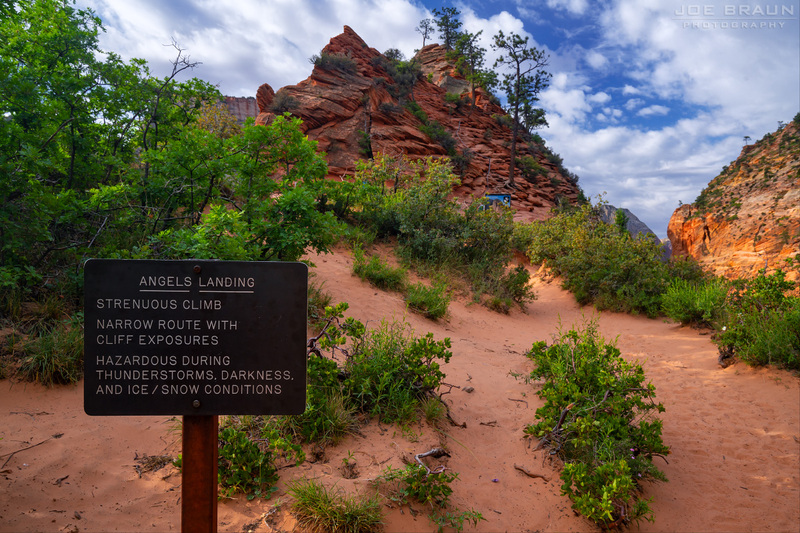 Winter is the most unpredictible season for hiking Angels Landing; the trail could be completely clear or it could be riddled with ice and snow from recent precipitation. Check conditions at the Visitor Center and play it safe! Many people ask when the best time is to photograph Angels Landing. That's a tough question to answer and is based on personal preference, but as is often the case, early morning and late afternoon will give you the most interesting light (with one side of the canyon cast in shadow), but be sure to get off the mountain well before dark. The middle of the afternoon on a clear day is probably the ugliest time for photography, but interesting or dramatic clouds can change everything. If you aren't intimidated by heights and you are in pretty good shape, do this hike! It is one of the most unique hikes and viewpoints in the world! I have done this hike a dozen or so times in my life and it is always an exhilarating experience. The only downside is that during the hot summer months, this route is very crowded from dawn to dusk. Whether you are faster or slower than others hiking this route, please be courteous and safe on the trail since there is not very much room for error!